Coinciding with one of our faculty members’ critical reflexion on Vicente Guallart’s views on the “death of urbanism”, the chief architect of Barcelona came to our campus last week to share his 10 Strategic Projects for Barcelona. Enunciating points such as “urbanism is no longer an isolated practice”, “we must add value to the constructed city”, or that ” the internet has changed our lives, but not our cities”, Guallart emphasized the importance of integrating technology with the aim of generating “many slow cities inside one smart city”. He illustrated this concept through the 10 proposals, or projects, which included things like “regreening”, social housing, and self-sufficient islands within the city. 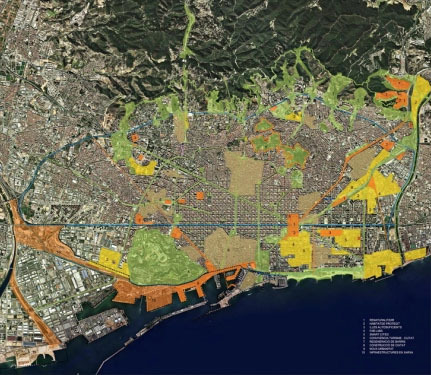 While seductive in presentation, Guallart’s approach to city regeneration is primarily, if not solely, architectural, and as seasoned urban planners (who believe strongly in interdisciplinary design), we are left wondering whether this is enough to establish an integrated strategy for the sustainable city of the future we all want Barcelona to be. Guallart’s talk was the first of a new series of open lectures at ESARQ-UIC. Next week features Barcelona-based architects Freddy Massad and Alicia Guerrero, followed by Manolo Gallego and international guests like Johnston Marklee and Peter Rich, among others.